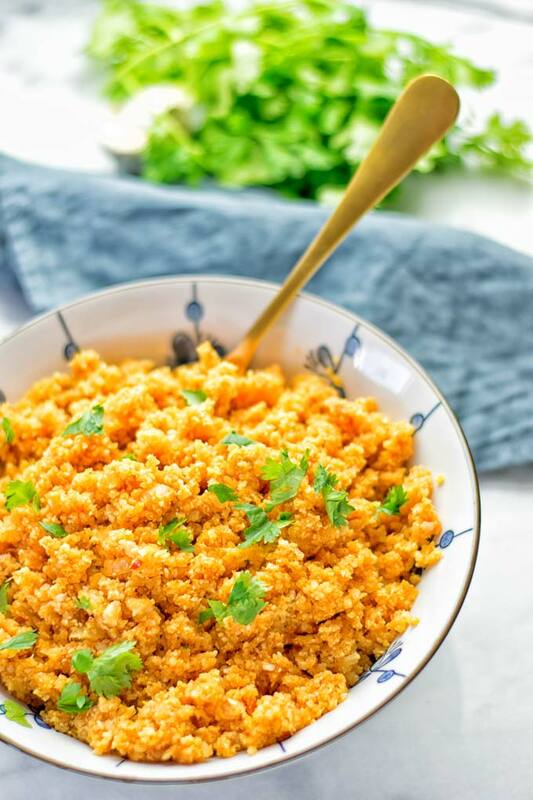 This Spanish Cauliflower Rice is naturally vegan, gluten free, and so easy to make in one pan in no time. Amazing on its own or as a side dish. I’ve just been to Washington DC recently. The vegan food was incredibly. I ate big plates with Philly cheese steaks, pitas filled with potatoes, fried eggplant and lots of tahini, burgers. Lots of ice cream, fries, pizzas, falafel, and of course sandwiches. You see I ate lots of tasty and delicious food. If you ever go there, try all their amazing plant based food. You won’t regret, seriously so good. Back at home in the Netherlands I feel like I’m craving something a bit healthier. Nothing against full and big plates of comfort food, hands up I’m always in. 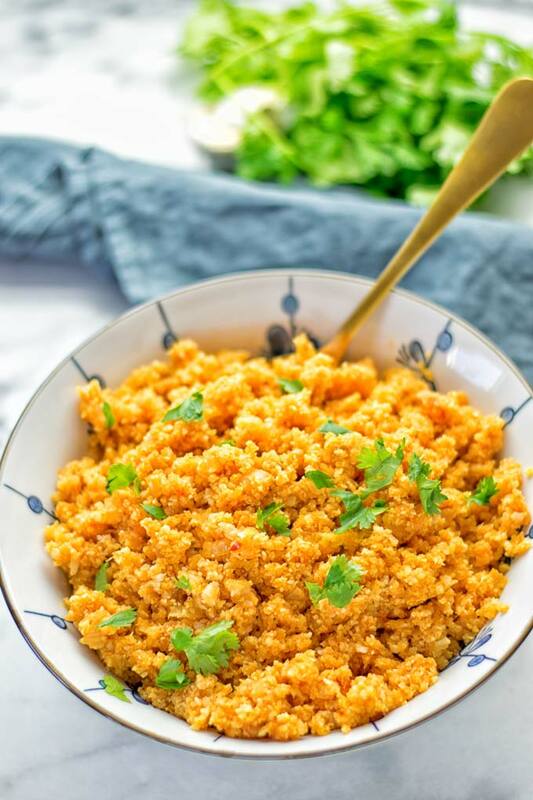 But for now I’m craving this Spanish Cauliflower Rice. It’s filling, perfectly flavorful, hearty, healthy, delicious, super easy to make and amazing to so many things. You know it’s not my first love for cauliflower rice. 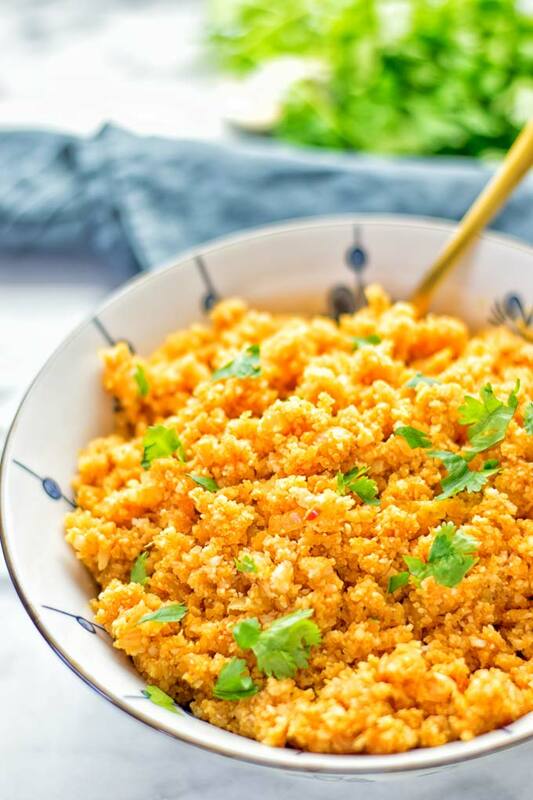 Have you checked out my Cauliflower Rice Buddha Bowl or Cilantro Lime Cauliflower Rice? If not, go for it! Just feel free to browse around. It’s fun use the search bar type cauliflower rice and let see the magic happen. 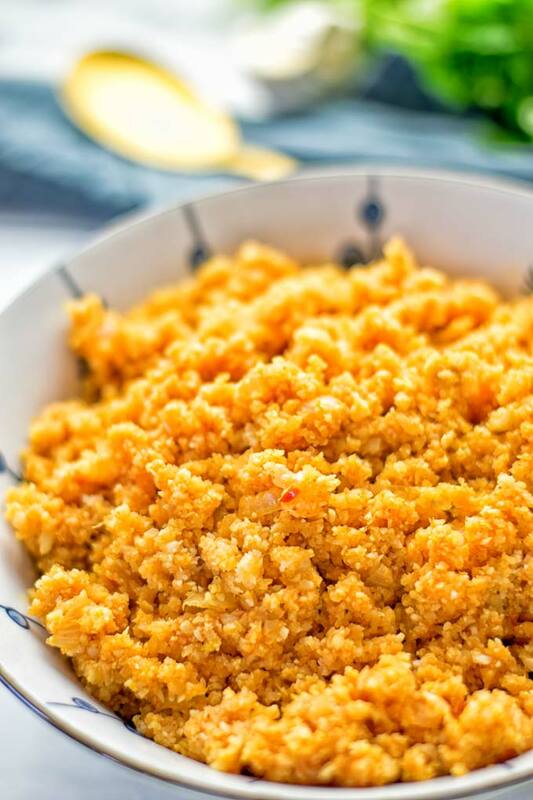 Seriously this Spanish Cauliflower Rice is a keeper. Not only if you have been on vacation like me and ate just too much delicious food. It’s so good with many things, you can add roasted veggies, falafel, or maybe my Vegetarian Swedish Meatballs. There are so many options but it’s totally delicious on its own. 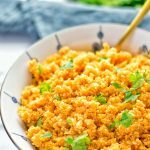 I really find no need for anything else, but you can get really creative with this Spanish Cauliflower Rice, so delicious with almost everything. Spanish rice is made obviously with rice. You can add brown or white. Then you can decide: some versions are made with butter and vegetable broth. Some use chopped tomatoes or bell pepper. 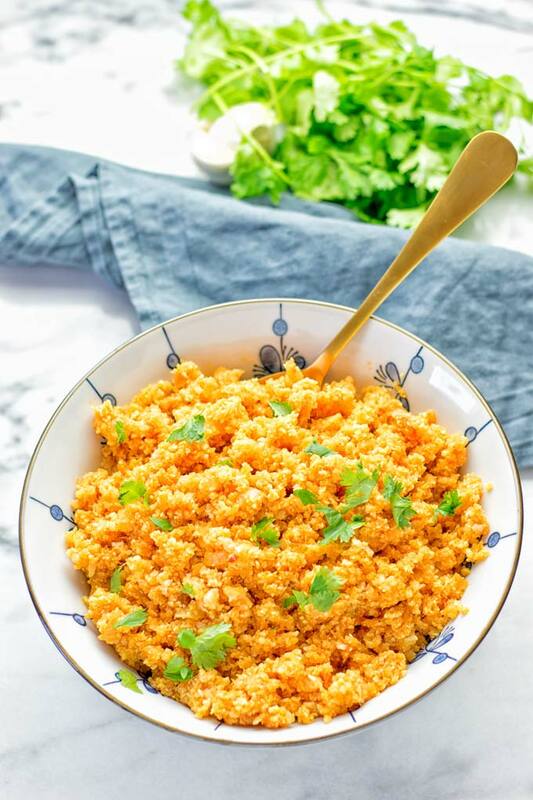 For this Spanish Cauliflower Rice you will need marinara, salsa, and tomato paste. I find these 3 components make this dish over the top. It really adds a lot of flavor depth, which is always the key to Spanish rice. 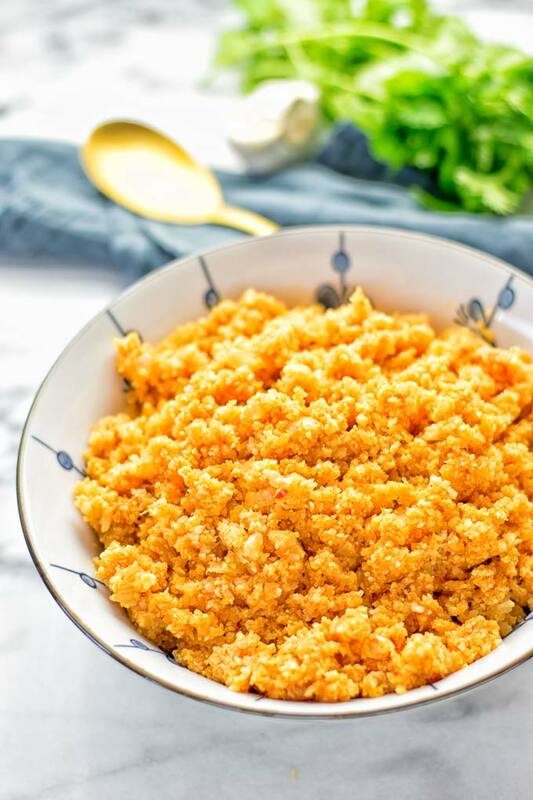 Making Cauliflower Rice is super easy. You can buy pre made Cauliflower Rice in your grocery store. It’s available fresh and frozen. If you make it by yourself, cut the cauliflower into florets. Next head over to a food processor. Add cauliflower florets to the machine. Pulse until you have a rice consistency. You can do that with the pulse button or simply use another program. That’s all. Set aside. 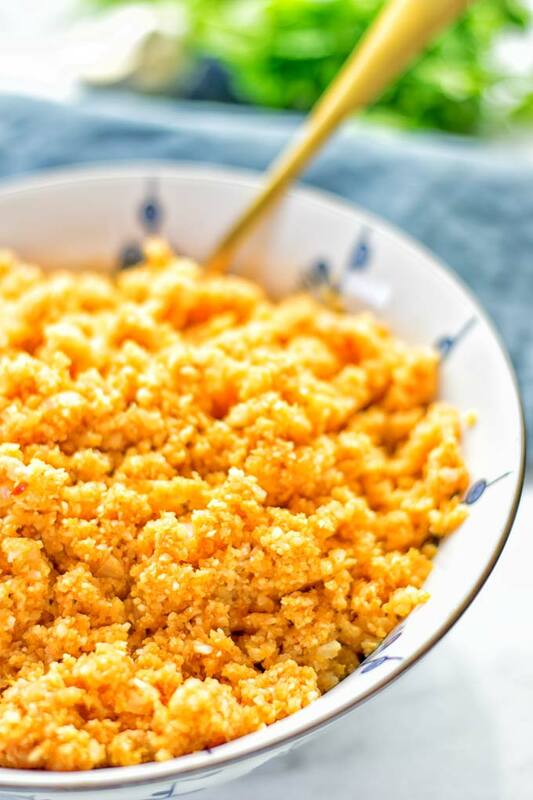 For the Spanish Cauliflower Rice recipe, you will need 4 cups of cauliflower rice. I would say use a medium cauliflower for that if you make it your own. Let’s getting straight to it. 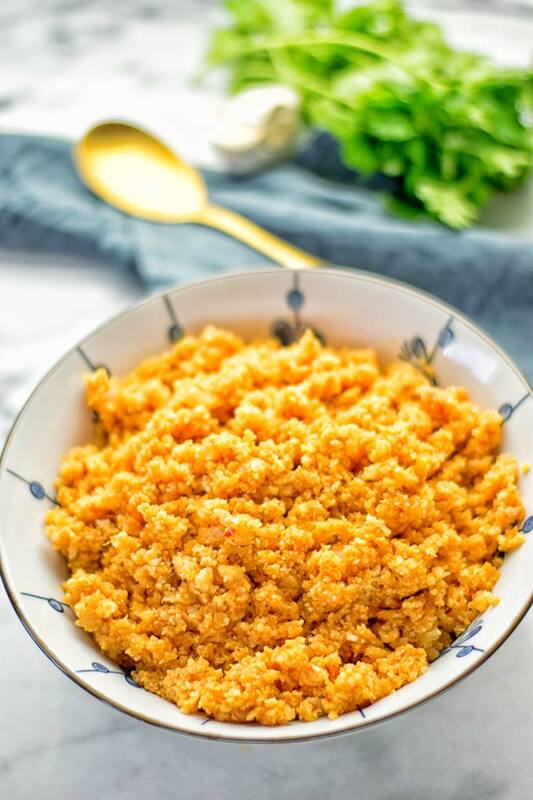 You only need one pan for this gluten free Spanish Rice: heat a bit of oil olive or use vegetable broth for oil-free cooking. Add diced onions and minced garlic, fry for around 2 minutes. Next, transfer the cauliflower rice to the pan and mix. Fry all for an extra 5 minutes. Then add tomato paste, marinara, and salsa to that pan. Combine everything and cook for 3 minutes more. Serve on plates or bowls plain or with other delicious things like I mentioned above for suggestions. This makes an amazing dinner, lunch or a delicious option for meal prep and work lunch. It’s just a fantastic carb free rice option good with so many things. 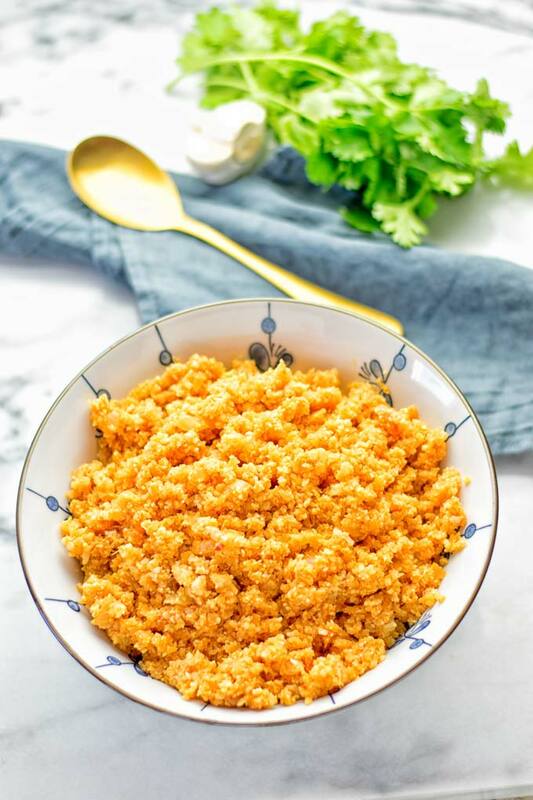 If you give this Spanish Cauliflower Rice a try, let me know with a tag on Instagram or Facebook. Keep going it with a picture love seeing all your remakes. In a pan, heat a bit of oil olive or use vegetable broth for oil-free cooking. Add diced onions and minced garlic, fry for around 2 minutes. Then add tomato paste, marinara, and salsa to that pan. Combine everything and cook for 3 minutes more.